I gave the Democrats an 80% chance of retaining the presidency when Donald Trump clinched the nomination in May. Trump’s seemed to me a symptom of Republican extremism rather than its cause. I didn’t think he could win enough white votes—I didn’t think there were enough additional white votes—to compensate for his unpopularity with the growing number of non-white voters. I thought that the “Republican Autopsy Report” was right to argue that unless the Republican Party reached out to Hispanic, black, Asian, and gay voters it would “be increasingly difficult for Republicans to win a presidential election in the near future”. I gave Clinton a 99% chance of winning in October when Hillary Clinton took a 7-point lead over Donald Trump in the Huffington Post poll aggregate. Clinton had never really gone below 45% in the head-to-head polling average since the campaign began; Trump had never gone above. The news was dominated Access Hollywood video of Trump bragging about sexually assaulting women and a series of sexual assault allegations against him that would probably have been enough on their own to doom a presidential candidate in a less partisan era. I gave Clinton a 97% chance of winning the night before the election. She was at least a couple of points ahead in the polling averages in enough states to win 27o electoral votes. Early voting figures indicated that she was also likely to win very likely to win Nevada. I was confident that her superior field operation and the remarkable editorial consensus that she was the better candidate would give her a small but significant advantage on election day. I was proud of my forecast. I posted it on Twitter. Hillary Clinton did not win. Maybe I was right. Maybe Trump would win only 3% of the time in similar situations. It’s impossible to say definitively that a single probabilistic forecast is wrong. Stranger things happen all the time. Over the course of a NBA season, around 37 games should have outcomes that unlikely.Presidents have been elected without winning the popular vote only four times before in US history. Trump’s victory was probably the most surprising election result since Harry Truman defeated Thomas Dewey in 1948 eighteen elections ago. Trump’s victory was also the most surprising outcome of any of the forty plus question I forecast for Good Judgment, Inc. this year. Maybe I was just unlucky this time. I still think my forecast was pretty bad. Any time something happens that you thought was unlikely, you have weigh the possibility that it was your forecast that was off. While most serious forecasters thought Clinton was likely to win, almost all of them were less confident in a Clinton victory than I was. Political science models actually predicted Clinton’s share of the popular vote fairly accurately—more than half of the models published in the October issue of PS predicted the popular margin within a point. Other forecasts were better than mine was. In hindsight, I probably gave too much weight to the polls. I didn’t think the polling average could be very far off across a variety of states; I underestimated the degree to which undecided and third-party voters could break in one candidate’s favor; and I discounted the possibility that Trump could win the electoral vote while losing the popular vote by as much as he did. Nate Silver—who again looks prescient—cautioned against making these mistakes, but at the time I thought he was wrong. I know my personal biases affected my forecast. I live in Hawaii, which may be the bluest state in the country. I certainly wanted Hillary to win. Research shows that people are more likely to trust the polls—and the polling methodology—that tells them what they want to hear. Maybe that was why I dismissed Nate Silver’s warnings, but found Sam Wang’s confident prediction that Clinton would win convincing. Most of all, it was hard for me to grasp that voters could support someone whom diverse groups of leading political scientists, economists, and scientists found dangerously unfit for the presidency, or who says and does the things Trump has. Even in hindsight, I don’t think Trump should have been the favorite. Maybe most forecasters missed the clues that indicated Trump would win. But Clinton led him almost wire-to-wire in the polling averages, which have generally been a reliable indicator of how presidential elections turn out. No credible poll during the campaign showed Trump leading in Wisconsin. There seemed to be very little evidence that there were “shy” Trump voters the polls were undercounting. Models that predicted Trump would win—like Allan Lichtman’s “Keys to the White House”—also wrongly predicted that Trump would win the popular vote. Some of the things that seem to have suggested Trump would win—large rallies, social media engagement—would have suggested Mitt Romney was going to win in 2012. The Republican National Committee’s own model predicted that Trump would lose. If I were forecasting the election again, I would lean less heavily on the polling averages. I would weigh how difficult it has historically been for one party to win a third consecutive presidential term more heavily. I have also come to believe that Trump’s victory and Britain’s vote to leave the EU are part of a broader reaction to globalization—part of what the political scientist Samuel Huntington would have called a “reverse wave” of democratization—that for some reason isn’t reflected in polls. If I were forecasting the election again, I would still have said that Clinton was the favorite. But I would have been a lot less sure of my prediction. Listen to NonProphets, the forecasting podcast I do with Atief Heermance and Scott Eastman (available on iTunes here). Links to books I recommend, review, or cite are Amazon Affiliate links. I receive a small percentage of any purchases made through these links. 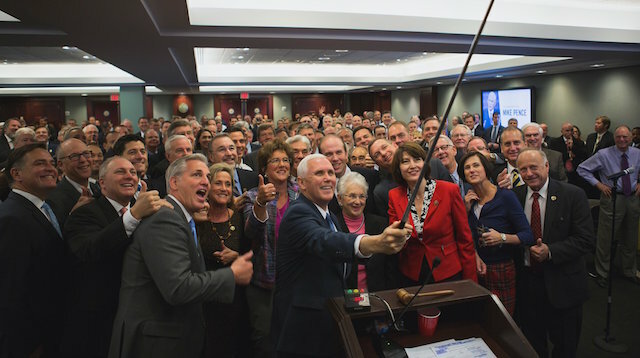 Mike Pence selfie image courtesy of the United States House of Representatives Republican Conference. This entry was posted in Forecasting and tagged donald trump, forecasting, hillary clinton, non-prophets, us election. Bookmark the permalink. 1 Response to How Bad Was My US Election Forecast?